Meet our Merchants – give ’em a like & check out their stores! Fairy Bliss is a lovely little boutique that specializes in handmade and commercial fairy wands, wings, halos, fairy furniture, fairy doors, ear wings, ear feathers, ear leaves, fairy catching kits. One of their wands was recently seen on King 5 News with Natasha Ryan as she was inducted into the realm as an honorary fairy for the day! The Enchanted Face Painter is a licensed make-up artist creating 1/4 , 1/2 or FULL face painting designs. Choose from hundreds of colorful and fun masks to wear all day and get in the spirit of your cosplay, costume or just have fun! Products are FDA compliant and safe for use on children and adults. Fire and Flame Sundries offers a selection of garb (men’s and women’s), jewelry and accessories, nerf prop guns, replica wooden swords, chain-mail. 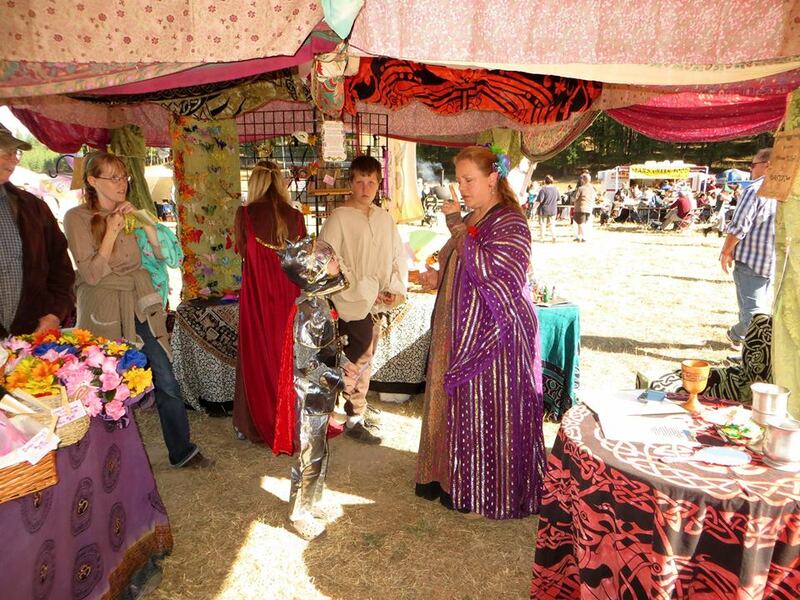 Th e Gilded Quill handmade magical supply store offers one of a kind creations for your magical and metaphysical needs. You can select from over 85 types wood for your hand-turned magic wands. Get customized, inscribed beeswax candles, quill pens, scented inks. Follow Gilded Quill on Pinterest and Twitter! Sher-leas specializes in on-site wax art, making beautiful fantasy candles as you watch! They also offer pouches, beaded banners & dragons, magnets and more! Wasson’s Whimziez makes handmade hair accessories and jewelry with a collection of other odds and ends. Willow-the-Wisp provides imported and hand made jewelry, incense and oil burners, knit and crochet scarves and caps, cloaks and capes, boffer swords.